Professor Narsey highlights the corruption and fraud in Fiji's electoral process being controlled by the FijiFirst Party that is also standing for elections! 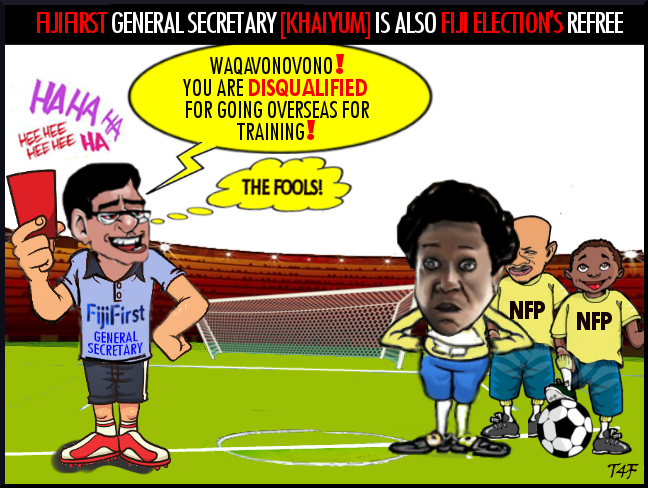 Prof Narsey writes that a fair game of rugby is not being played in Fiji's electoral process! Two teams FFP (Fiji Football Players) and NFP (National Football Players) have just fielded their players on the field, in an all-important game that is taking place after eight years. Just as the game is about to begin, the referee, who is also a player from the FFP team, cunningly announces a change of rules: any player who has been away overseas for more than 18 months in the previous 2 years, will not be allowed to play. This referee, [Khaiyum, who is also the General Secretary for the opposing FijiFirst Party] claims to be neutral, then pulls out his red card, and sends three members of the more skillful members of the opposing NFP Team packing to the side lines, because they have previously been away overseas for training with better quality teams than available in Fiji. The red card is not applied to any players who have been sent overseas by government, which the FFP has been controlling for eight years. Is this a fair rugby game? NO! Click HERE to read Prof Narsey's full article.